“If [OFIR] takes Oregon’s 30-year-old sanctuary law off the books, then it’s paving the way for local law enforcement to abide by federal immigration guidelines,” Iboa said. With the new threat in place, Iboa noted One Oregon’s coalition activity went into “overdrive.” The first objective was putting a face to the issue, which as Ye noted, also pertains to the recent rise of Islamophobia, as many of APANO’s immigrant community members are from Southeast Asia and identify as Muslim. “For us (APANO), it’s more of politicizing our community, especially with members with darker complexions or Muslims,” Ye said. Ye also noted the history of Asians in the United States involves “always being regarded as foreigners in their own county,” as seen in Japanese internment camps during World War II and the Chinese Exclusion Act of 1882. The act symbolized what Ye sees as “the new target being the most convenient” — or in other words, how the robust Chinese-American population of the time was targeted and accused of “robbing jobs” in the U.S., due to anti-immigrant sentiment, a systemic issue dating back to the nation’s founding, he said. Recently, there’s been a turning point in efforts to reinforce the U.S. as an immigrant-friendly nation, said Iboa. “Right after the  election, our civic engagement director provided everyone at Causa Oregon with ‘a toolkit’ on how to implement an inclusivity measure,” he said. The toolkit allows for coalition coordinators, like Iboa, to travel throughout multiple counties in Oregon and advocate for “inclusivity measures,” or sanctuary city measures. Iboa implemented the toolkit in Eugene soon after the 2016 election, leading to the 2017 Protections for Individuals ordinance, which protects all residents, including immigrants, in Eugene. According to Iboa, the city ordinance is considered the first line of defense in preventing the city, police and Immigration Customs Enforcement (ICE) from enforcing federal immigration law. One Oregon primarily works against racial and social injustices directed toward immigrant and Muslim communities. While the statewide coalition’s short-term objective focuses on stopping OFIR from putting IP22 on the ballot, the coalition’s long-term goal requires wide-scale collaboration with organizations from within, according to Iboa. The One Oregon coalition collaborates with Oregon Ready, another alliance elevating the conversation of immigrant community needs and issues. However, as Iboa pointed out, the Oregon Ready coalition provides legal services, specifically. 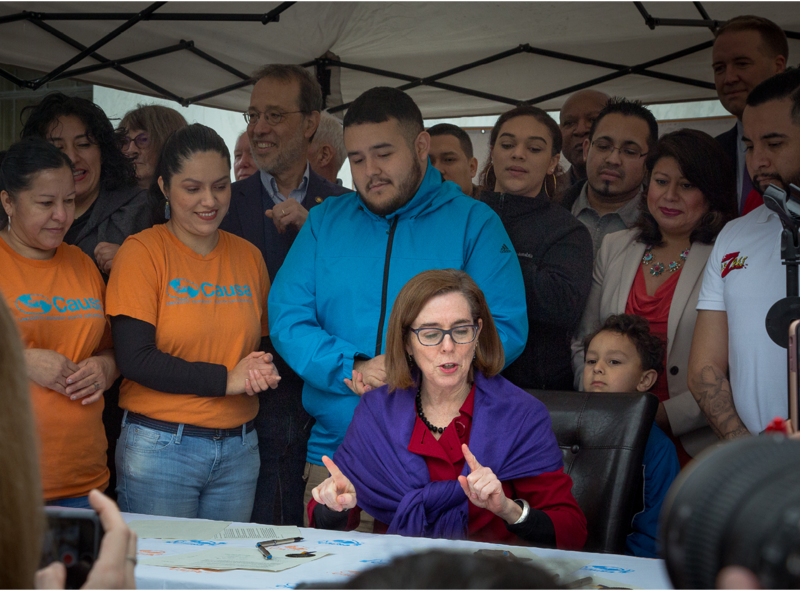 “If there’s a robust immigrant community in a rural part of Oregon where there’s no legal services, Oregon Ready knows individuals working directly with immigration issues, and refers those individuals to them,” Iboa said. Iboa hones in on recruiting affected Latino community members and developing their leadership and public speaking skills before approaching legislators or others with opposing viewpoints. By sending those who are “most impacted by the issue” to speak to legislators, the members are able to give first-hand accounts of the struggles facing immigrant communities in Oregon. Ye’s position as a field organizer allows him to focus on member engagement on the grassroots level, specifically with Asian and Pacific Islander immigrants. APANO also incorporates political education in its advocacy work by empowering immigrants to tell their story. Ye refers to “model minority mix” as the stereotype of the “perfect Asian” — who are described as high-achieving, hardworking and submissive in demeanor. The term is deeply rooted in white nationalist ideas that persist in our society, which includes the hypersexual, obedient perspective some male individuals perceive of Asian women. As acknowledged by Iboa and Ye, demystifing false claims about immigration remain an integral part of their multifaceted strategy to change the hearts and minds of Oregonians. In fact, the Hispanic and Latino population in the U.S. grew 60 percent from 2000 to 2015, compared to the Asian communities in the country, which reached 72 percent during the same period. While the numbers do show an increasing trend, some people’s attitudes toward immigrants isn’t always positive. With the possibility of IP22, One Oregon plans to target Oregon residents identifying in the middle of the political spectrum for its political advocacy work.Ye and Iboa feel their multifaceted strategy will help prevent OFIR from getting the legislation on the ballot. 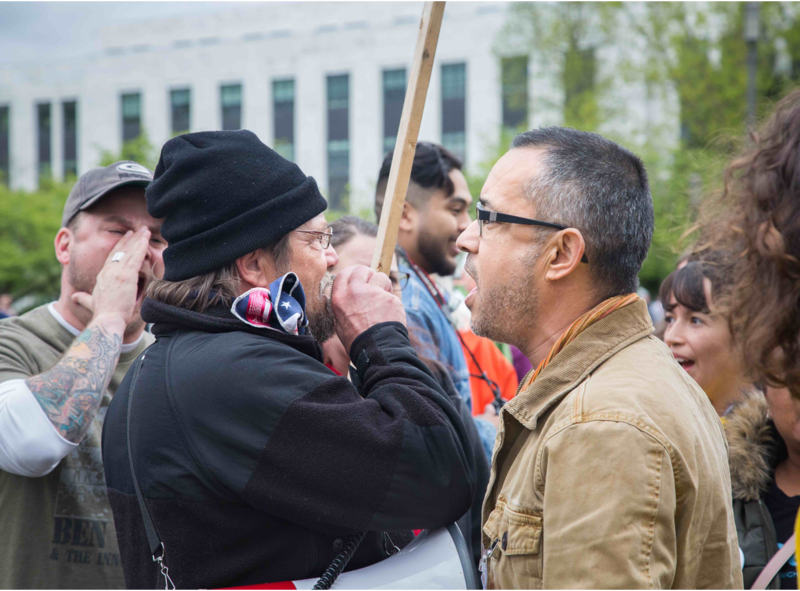 Similar to Causa Oregon, APANO believes the short-term focus rests on protecting Oregon’s sanctuary state law, while the long-term consists of engaging with conflicted individuals on the issue of immigration. Ye and Iboa both echo how the ongoing conflict pertains to asking the question,“What is America?” to those with polarizing views. Even affected immigrants later learn that when approaching the public regarding issues of immigration, it’s difficult to get people to see a different perspective, according to Iboa. Garcia agrees that Oregon is a welcoming state, although anti-immigrant hate groups, such as OFIR, threaten Oregon’s reputation of being a hospitable state to immigrants. Her experience interacting with those strongly against immigration to the U.S. remain lodged in the back of her mind — just like the instance with her neighbors. And for Iboa, Oregon isn’t some random plot of land on a map. The people, culture and the state itself is his home. At the May Day rally, Gov. Kate Brown signed two bills, Senate Bill (SB) 1563 and House Bill (HB) 4111. 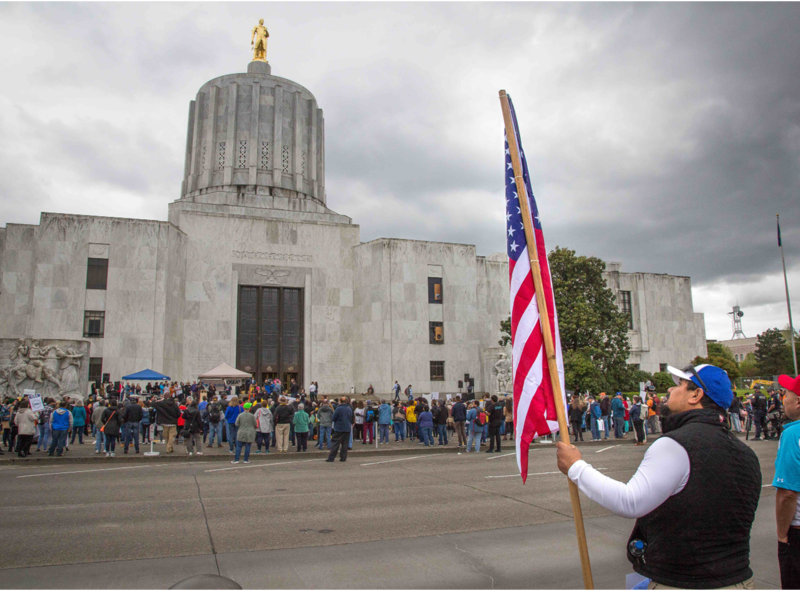 A crowd of around 300 people marched for immigrant rights during the May Day rally and march at the Oregon State Capitol on May 1, 2018.